This article refers to the Buddhist concept of "stream-enterer". For the Toronto based meditation organization see Sotapanna Meditation. In Buddhism, a sotāpanna (Pali), srotāpanna (Sanskrit; Chinese: 入流; pinyin: rùliú, Tibetan: རྒྱན་ཞུགས, Wylie: rgyun zhugs ), "stream-winner", or "stream-entrant" is a person who has seen the Dharma and consequently, has dropped the first three fetters (saŋyojana) that bind a being to rebirth, namely self-view (sakkāya-ditthi), clinging to rites and rituals (sīlabbata-parāmāsa), and skeptical indecision (Vicikitsa). The word sotāpanna literally means "one who entered (āpanna) the stream (sota)", after a metaphor which calls the noble eightfold path a stream which leads to nibbāna. Entering the stream (sotāpatti) is the first of the four stages of enlightenment. The first moment of the attainment is termed the path of stream-entry (sotāpatti-magga), which cuts through the first three fetters. The person who experiences it is called a stream-winner (sotāpanna). The sotāpanna is said to attain an intuitive grasp of the dharma, this wisdom being called right view (sammā diṭṭhi) and has unshakable confidence in the Buddha, Dharma, and Sangha. The Buddha, Dharma, and Sangha, sometimes taken to be the triple refuge, are at other times listed as being objects of recollection. 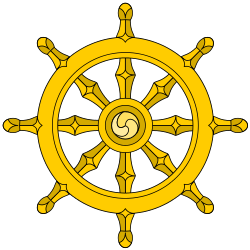 In general though, confirmed confidence in the Buddha', Dharma and Sangha, respectively, is considered to be one of the four limbs of stream-winning (sotāpannassa angāni). The sotapanna is said to have "opened the eye of the Dharma" (dharmacakkhu), because they have realized that whatever arises will cease (impermanence). Their conviction in the true dharma would be unshakable. However, the remaining three paths, namely: once-return (sakadāgāmin), non-return (anāgāmin), and sainthood (arahatta) become 'destined' (sammatta niyāma) for the stream-entrant. Their enlightenment as a disciple (ariya-sāvaka) becomes inevitable within seven lives transmigrating among gods and humans; if they are diligent (appamatta, appamāda) in the practice of the Teacher's (satthāra) message, they may fully awaken within their present life. They have very little future suffering to undergo. The early Buddhist texts (e.g. the Ratana Sutta) say that a stream-entrant will no longer be born in the animal womb, or hell realms; nor as a hungry ghost. The pathways to unfortunate rebirth destinations (duggati) have been closed to them. It's impossible for them to commit the six "heinous crimes" (abhithanani), which would otherwise lead to aeons in hell. These six being: i. matricide, ii. patricide, iii. the murder of an arahat, iv. shedding a Buddha's blood with malicious intent, v. causing schism in the monastic Sangha, and vi. taking another teacher. They are reborn only in "noble" human families, or as divine beings. …those monks who have abandoned the three fetters, are all stream-winners, steadfast, never again destined for states of woe, headed for self-awakening. This is how the Dharma well-proclaimed by me is clear, open, evident, stripped of rags. Self-view — The view of substance, or that what is compounded (sankhata) could be eternal in the five aggregates (form, feelings, perception, intentions, cognizance), and thus possessed or owned as 'I', 'me', or 'mine'. A sotāpanna doesn't actually have a view about self (sakkāya-ditthi), as that doctrine is proclaimed to be a subtle form of clinging. Clinging to rites and rituals - Eradication of the view that one becomes pure simply through performing rituals (animal sacrifices, ablutions, chanting, etc.) or adhering to rigid moralism or relying on a god for non-causal delivery (issara nimmāna). Rites and rituals now function more to obscure, than to support the right view of the sotāpanna's now opened dharma eye. The sotāpanna realizes that deliverance can be won only through the practice of the Noble Eightfold Path. It is the elimination of the notion that there are miracles, or shortcuts. Skeptical doubt - Doubt about the Buddha, his teaching (Dharma), and his community (Sangha) is eradicated because the sotāpanna personally experiences the true nature of reality through insight, and this insight confirms the accuracy of the Buddha’s teaching. Seeing removes doubt, because the sight is a form of vision (dassana), that allows one to know (ñāṇa). A sotāpanna will be safe from falling into the states of misery (they will not be born as an animal, ghost, or hell being). Their lust, hatred and delusion will not be strong enough to cause rebirth in the lower realms. A sotāpanna will have to be reborn at most only seven more times in the human or heavenly worlds before attaining nibbāna. It is not necessary for a sotāpanna to be reborn seven more times before attaining nibbāna, as an ardent practitioner may progress to the higher stages in the same life in which he/she reaches the Sotāpanna level by making an aspiration and persistent effort to reach the final goal of nibbāna. Maliciously injuring the Buddha to the point of drawing blood. Deliberately creating a schism in the monastic community. Taking another Teacher [besides Buddha]. The Buddha spoke favorably about the sotapanna on many occasions, and even though it is (only) the first of ariya sangha members, he or she is welcomed by all other sangha-members for he or she practices for the benefit and welfare of many. In the literature, the arya sangha is described as "the four" when taken as pairs, and as "the eight" when taken as individual types. This refers to the four supra-mundane fruits (attainments: "phala") and the corresponding four supra-mundane paths (of those practicing to attain those fruits: "magga"). "The Sangha of the Blessed One's disciples who have practiced well... who have practiced straight-forwardly... who have practiced methodically... who have practiced masterfully — in other words, the four types [of noble disciples] when taken as pairs, the eight when taken as individual types — they are the Sangha of the Blessed One's disciples: worthy of gifts, worthy of hospitality, worthy of offerings, worthy of respect, the incomparable field of merit for the world." This is called "the recollection of the Sangha" (sanghanussati). It can also be interpreted as, "They are the Blessed One's disciples, who have practiced well, who have practiced directly, who have practiced insight-fully, those who practice with integrity (to share what they have learned with others). They give occasion for incomparable goodness to arise in the world because gifts to them bear great fruit and benefit to the giver. The fifty-fifth Samyutta of the Samyutta Nikaya is called the Sotāpatti-saṃyutta, and concerns sotapannas and their attainment. In the discourse-numbers (of that chapter) 1-4, 6-9, 11-14, 16-20, 22-36, 39-49, 51, 53, 54, sotapannas are praised as Sangha members by and to: the sick, lay followers, people on their deathbed, bhikkhunis, bhikkhus, and devas, and end up for being the well-being and benefit of many. The first fruit is that of Srotāpanna, a Sanskrit word which means "One Who Has Entered the Flow." He opposes the flow of common people's six dusts and enters the flow of the sage's dharma-nature. Entering the flow means entering the state of the accomplished sage of the Small Vehicle. ↑ "A Glossary of Pali and Buddhist Terms". Access to Insight. Retrieved 2010-08-22. ↑ Snyder, David. "Definition of a Buddhist". The Dhamma. ↑ Bhikkhu, Thanissaro. "Intro the Stream: A Study Guide on the First Stage of Awakening". Access to Insight. Very good, Sariputta! Very good! This noble eightfold path — right view, right resolve, right speech, right action, right livelihood, right effort, right mindfulness, right concentration — is the stream. ↑ Sujato, Bhikkhu. "A Swift Pair of Messengers". Santipada. ↑ Sister Ayya Khema. "All of Us". Access to Insight. Retrieved 2009-03-16. ↑ Bhikkhu Bodhi. "The Noble Eightfold Path". Access to Insight. Retrieved 2009-03-16. ↑ Tan, Piya. "Sarakani Sutta 1" (PDF). The Dharmafarers. Retrieved 25 June 2015. Even these great sal trees,43 Mahanama, if they could understand what is well spoken and what is ill spoken, I would declare them to be streamwinners, no longer bound to the lower world, of fixed destiny, sure of awakening! ↑ Bhikkhu, Thanissaro. "Maha-cattarisaka Sutta: The Great Forty". Access to Insight. "And what is the right view that is noble, without effluents, transcendent, a factor of the path? The discernment, the faculty of discernment, the strength of discernment, analysis of qualities as a factor for awakening, the path factor of right view in one developing the noble path whose mind is noble, whose mind is without effluents, who is fully possessed of the noble path. This is the right view that is noble, without effluents, transcendent, a factor of the path. ↑ Tan, Piya. "(Agata,phala) Mahanama Sutta" (PDF). ↑ Nyanatiloka, Maha Thera. "Sotapannassa angani". Dhamma Wiki. ↑ Bhikkhu, Thanissaro. "Upatissa-pasine: Upatissa's (Sariputta's) Question". Access to Insight. Retrieved 25 June 2015. Then to Sariputta the wanderer, as he heard this Dhamma exposition, there arose the dustless, stainless Dhamma eye: "Whatever is subject to origination is all subject to cessation." ↑ Tan, Piya. "Sarakani Sutta 1" (PDF). The Dharmafarers. Retrieved 25 June 2015. 11 The 4 qualities of a streamwinner: (1) unshakable faith in the Buddha, (2) in the Dharma, and (3) in the Sangha; and (4) moral virtue dear to the saints. ↑ Nyanatiloka, Maha Thera. "Manual of Buddhist Terms and Doctrines". Dhamma Wiki. Retrieved 25 June 2015. ↑ Bhikkhu, Thanissaro. "Sekha Sutta: The Learner". Access to Insight. Retrieved 25 June 2015. ↑ Bhikkhu, Thanissaro. ["My friend, although I have seen properly with right discernment, as it actually is present, that 'The cessation of becoming is Unbinding,' still I am not an arahant whose fermentations are ended. It's as if there were a well along a road in a desert, with neither rope nor water bucket. A man would come along overcome by heat, oppressed by the heat, exhausted, dehydrated, & thirsty. He would look into the well and would have knowledge of 'water,' but he would not dwell touching it with his body. In the same way, although I have seen properly with right discernment, as it actually is present, that 'The cessation of becoming is Unbinding,' still I am not an arahant whose fermentations are ended." "Kosambi Sutta: At Kosambi (On Knowing Dependent Co-arising)"] Check |url= value (help). Access to Insight. ↑ Thera, Piyadassi. "Ratana Sutta". Access to Insight. ↑ Bhikkhu, Thanissaro. "Nakhasikha Sutta". Access to Insight. Retrieved 25 June 2015. ↑ Bhikkhu, Thanissaro. "Cakkhu Sutta". Access to Insight. Retrieved 25 June 2015. He is incapable of doing any deed by which he might be reborn in hell, in the animal womb, or in the realm of hungry shades. He is incapable of passing away until he has realized the fruit of stream-entry. ↑ Tan, Piya. "Bahu Dhatuka Sutta" (PDF). The Dharmafarers. Retrieved 25 June 2015. (4) He understands that it is impossible, there is no chance, that an individual attained to right view, would deprive his mother of life—this is not possible.41 And he understands that it is possible, there is the chance, that an ordinary worldling, would deprive his mother of life—this is possible. (5) He understands that it is impossible, there is no chance, that  an individual attained to right view, would deprive his father of life—this is not possible. And he understands that it is possible, there is the chance, that an ordinary worldling, would deprive his father of life—this is possible. (6) He understands that it is impossible, there is no chance, that an individual attained to right view, would deprive an arhat of life—this is not possible. And he understands that it is possible, there is the chance, that an ordinary worldling, would deprive an arhat of life—this is possible. (7) He understands that it is impossible, there is no chance, that an individual attained to right view, would draw the Tathagata’s blood—this is not possible. And he understands that it is possible, there is the chance, that an ordinary worldling, would draw the Tathagata’s blood—this is possible. (8) He understands that it is impossible, there is no chance, that an individual attained to right view, would divide the monastic order [the Sangha]—this is not possible. And he understands that it is possible, there is the chance, that an ordinary worldling, would divide the monastic order—this is possible. (9) He understands that it is impossible, there is no chance, that an individual attained to right view, would proclaim another Teacher—this is not possible.42 And he understands that it is possible, there is the chance, that an ordinary worldling, would declare another Teacher—this is possible. ↑ "Alagaddupama Sutta". Access to Insight. Retrieved 2009-03-16. ↑ Thanissaro Bhikkhu. "Stream Entry". Access to Insight. Retrieved 2009-03-16. ↑ Thanissaro Bhikkhu. "The Noble Eightfold Path". Access to Insight. Retrieved 2009-03-16. ↑ Nyanaponika Thera. "The Simile of the Cloth & The Discourse on Effacement". Access to Insight. Retrieved 2009-03-16. ↑ Bhikkhu Bodhi. "Transcendental Dependent Arising". Access to Insight. Retrieved 2009-03-16. ↑ Henepola Gunaratana. "The Jhanas". Access to Insight. Retrieved 2009-03-16. ↑ "Sangha". Access to Insight. Retrieved 2010-08-22. ↑ Venerable Master Hsuan Hua. "The Vajra Prajna Paramita Sutra - A General Explanation" (PDF). Buddhist Text Translation Society. Retrieved 2009-09-16. Thanissaro Bhikkhu (2006). Stream Entry (Part 1: The Way to Stream-entry). Retrieved 28 Sep 2007 from Access to Insight. Thanissaro Bhikkhu (2004). Stream Entry (Part 2: Stream-entry and After). Retrieved 28 Sep 2007 from Access to Insight. Samyutta Nikaya , translation from Mahindarama Temple, Penang, Malaysia.